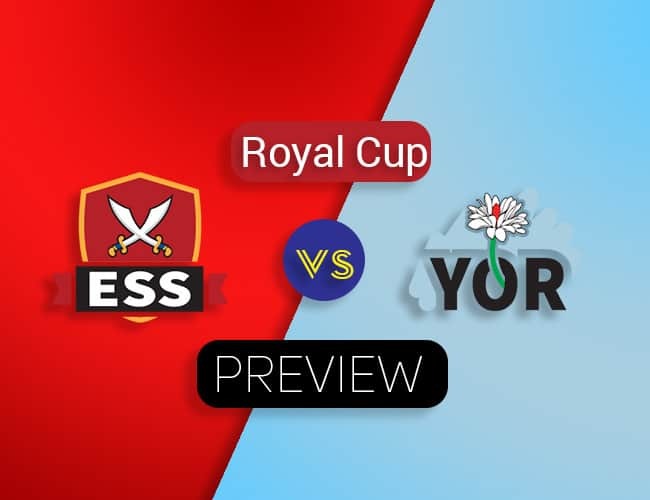 Hello and welcome to our preview for Essex Eagles versus Yorkshire Vikings 2nd quarterfinal match in the Royal London ODI Cup. We are covering ESS vs YOR Dream11 Team Prediction, Preview and Probable XI for the match. Essex will head into this match with three back to back wins to their names. But, now they are without the services of their regular captain Ryan ten Doeschate, who is suspended by ECB for next two matches. So, in his absence, Tom Westley is going to be the captain of the side. Yorkshire has a quite convincing tournament so far with 5 wins in 7 matches they have played in the series. They are also on a four-match winning streak before coming into this match. But, now they will be without 5 of their key international players who are out of the team for their respective national sides. The following average scores are of Royal London Cup 2018 ODI matches played on this ground. One more thing to consider while creating your team is that Essex batsman found it very easy to score runs on this ground as they have scored 313, 294 and 337 runs in three matches while batting first and in another occasion, they have chased 200 runs in 31.3 overs. Alastair Cook has been added into the squad after ECB suspended their captain Ryan ten Doeschate. Cook is expected to bat in the top order. Right arm medium fast bowler Matt Quinn is also added after Shane Snater left for his national duties with the Netherlands. Joe Root, Adil Rashid, David Willey, Liam Plunkett and Cheteshwar Pujara have to leave the team for their national sides and in place of them Harry Brook, Jack Brooks, Ben Coad, Jack Leaning, Jordan Thompson has been added in the squad. In absence of leg break bowler Adil Rashid, Slow left-arm orthodox bowler Karl Carver is expected to get a chance. Grand League Tip: Alastair Cook is expected to open the innings with Varun Chopra, till the time of writing this article only 2.47% people have taken him in their teams. So, he can be your differential pick for the Grand League. The last match he played on this ground he scored a wonderful 133 runs against Nottinghamshire. Yorkshire will be without their core which has led them to the quarterfinals, so, they will be huge underdogs for this match. Yorkshire has won only two of the last nine meetings between these two counties in List A matches. Varun Chopra enjoyed making runs in this venue this season, his last four scores read, 13, 98, 61, 160. Jamie Porter has taken two 4 wicket hauls in this venue in last two matches.